At least 26 people died in Cairo over the weekend during violent rioting in Egypt. On Monday, the Egyptian Coptic church blasted state officials for sanctioning attacks by the Egyptian military on Christians who were attempting to stage a peaceful protest in Cairo over the attack on a church. It was the worst violence since the 18-day uprising that ousted former Egyptian President Hosni Mubarak in February. By any measure, it was a terrible day in Egypt, but not an unusual one for humankind. Turn on the radio or TV or the internet on any day, and you're likely to find a story about death, a story about war, or a story about genocide. Taken one way, the 20th and now 21st century resembles an unending tableau of human violence and cruelty. Or so it would seem to almost any objective observer, but not Steven Pinker. In his new book — "The Better Angels of Our Nature: Why Violence Has Declined" — the Harvard psychology professor writes that contrary to conventional wisdom, violence has actually declined - and declined dramatically - in recent human history. 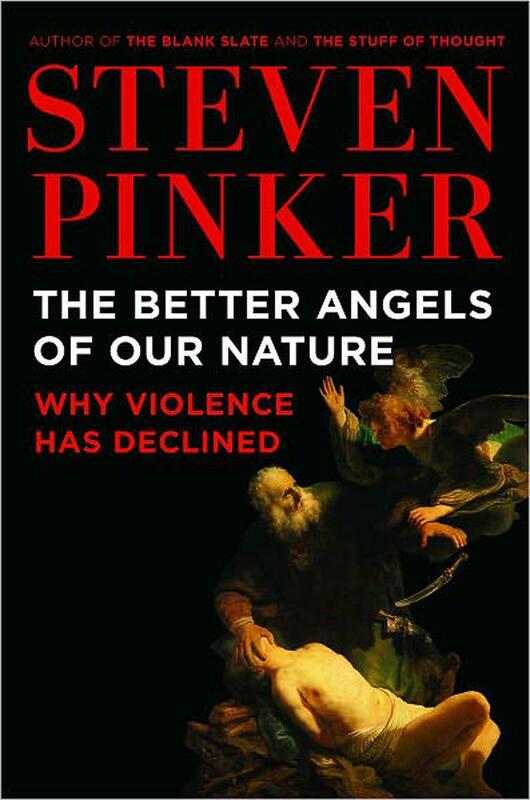 Steven Pinker, professor of psychology at Harvard University and author of "The Better Angels of Our Nature: Why Violence Has Declined"
This book is about what may be the most important thing that has ever happened in human history. Believe it or not—and I know that most people do not—violence has declined over long stretches of time, and today we may be living in the most peaceable era in our species’ existence. The decline, to be sure, has not been smooth; it has not brought violence down to zero; and it is not guaranteed to continue. But it is an unmistakable development, visible on scales from millennia to years, from the waging of wars to the spanking of children. No aspect of life is untouched by the retreat from violence. Daily existence is very different if you always have to worry about being abducted, raped, or killed, and it’s hard to develop sophisticated arts, learning, or commerce if the institutions that support them are looted and burned as quickly as they are built. The historical trajectory of violence affects not only how life is lived but how it is understood. What could be more fundamental to our sense of meaning and purpose than a conception of whether the strivings of the human race over long stretches of time have left us better or worse off? How, in particular, are we to make sense of modernity—of the erosion of family, tribe, tradition, and religion by the forces of individualism, cosmopolitanism, reason, and science? So much depends on how we understand the legacy of this transition: whether we see our world as a nightmare of crime, terrorism, genocide, and war, or as a period that, by the standards of history, is blessed by unprecedented levels of peaceful coexistence. The question of whether the arithmetic sign of trends in violence is positive or negative also bears on our conception of human nature. Though theories of human nature rooted in biology are often associated with fatalism about violence, and the theory that the mind is a blank slate is associated with progress, in my view it is the other way around. How are we to understand the natural state of life when our species first emerged and the processes of history began? The belief that violence has increased suggests that the world we made has contaminated us, perhaps irretrievably. The belief that it has decreased suggests that we started off nasty and that the artifices of civilization have moved us in a noble direction, one in which we can hope to continue. This is a big book, but it has to be. First I have to convince you that violence really has gone down over the course of history, knowing that the very idea invites skepticism, incredulity, and sometimes anger. Our cognitive faculties predispose us to believe that we live in violent times, especially when they are stoked by media that follow the watchword “If it bleeds, it leads.” The human mind tends to estimate the probability of an event from the ease with which it can recall examples, and scenes of carnage are more likely to be beamed into our homes and burned into our memories than footage of people dying of old age.1 No matter how small the percentage of violent deaths may be, in absolute numbers there will always be enough of them to fill the evening news, so people’s impressions of violence will be disconnected from the actual proportions. Also distorting our sense of danger is our moral psychology. No one has ever recruited activists to a cause by announcing that things are getting better, and bearers of good news are often advised to keep their mouths shut lest they lull people into complacency. Also, a large swath of our intellectual culture is loath to admit that there could be anything good about civilization, modernity, and Western society. But perhaps the main cause of the illusion of ever-present violence springs from one of the forces that drove violence down in the first place. The decline of violent behavior has been paralleled by a decline in attitudes that tolerate or glorify violence, and often the attitudes are in the lead. By the standards of the mass atrocities of human history, the lethal injection of a murderer in Texas, or an occasional hate crime in which a member of an ethnic minority is intimidated by hooligans, is pretty mild stuff. But from a contemporary vantage point, we see them as signs of how low our behavior can sink, not of how high our standards have risen. In the teeth of these preconceptions, I will have to persuade you with numbers, which I will glean from datasets and depict in graphs. In each case I’ll explain where the numbers came from and do my best to interpret the ways they fall into place. The problem I have set out to understand is the reduction in violence at many scales—in the family, in the neighborhood, between tribes and other armed factions, and among major nations and states. If the history of violence at each level of granularity had an idiosyncratic trajectory, each would belong in a separate book. But to my repeated astonishment, the global trends in almost all of them, viewed from the vantage point of the present, point downward. That calls for documenting the various trends between a single pair of covers, and seeking commonalities in when, how, and why they have occurred. Too many kinds of violence, I hope to convince you, have moved in the same direction for it all to be a coincidence, and that calls for an explanation. It is natural to recount the history of violence as a moral saga—a heroic struggle of justice against evil—but that is not my starting point. My approach is scientific in the broad sense of seeking explanations for why things happen. We may discover that a particular advance in peacefulness was brought about by moral entrepreneurs and their movements. But we may also discover that the explanation is more prosaic, like a change in technology, governance, commerce, or knowledge. Nor can we understand the decline of violence as an unstoppable force for progress that is carrying us toward an omega point of perfect peace. It is a collection of statistical trends in the behavior of groups of humans in various epochs, and as such it calls for an explanation in terms of psychology and history: how human minds deal with changing circumstances. A large part of the book will explore the psychology of violence and nonviolence. The theory of mind that I will invoke is the synthesis of cognitive science, affective and cognitive neuroscience, social and evolutionary psychology, and other sciences of human nature that I explored in How the Mind Works, The Blank Slate, and The Stuff of Thought. According to this understanding, the mind is a complex system of cognitive and emotional faculties implemented in the brain which owe their basic design to the processes of evolution. Some of these faculties incline us toward various kinds of violence. Others—“the better angels of our nature,” in Abraham Lincoln’s words—incline us toward cooperation and peace. The way to explain the decline of violence is to identify the changes in our cultural and material milieu that have given our peaceable motives the upper hand. Finally, I need to show how our history has engaged our psychology. Everything in human affairs is connected to everything else, and that is especially true of violence. Across time and space, the more peaceable societies also tend to be richer, healthier, better educated, better governed, more respectful of their women, and more likely to engage in trade. It’s not easy to tell which of these happy traits got the virtuous circle started and which went along for the ride, and it’s tempting to resign oneself to unsatisfying circularities, such as that violence declined because the culture got less violent. Social scientists distinguish “endogenous” variables—those that are inside the system, where they may be affected by the very phenomenon they are trying to explain—from the “exogenous” ones—those that are set in motion by forces from the outside. Exogenous forces can originate in the practical realm, such as changes in technology, demographics, and the mechanisms of commerce and governance. But they can also originate in the intellectual realm, as new ideas are conceived and disseminated and take on a life of their own. The most satisfying explanation of a historical change is one that identifies an exogenous trigger. To the best that the data allow it, I will try to identify exogenous forces that have engaged our mental faculties in different ways at different times and that thereby can be said to have caused the declines in violence. The discussions that try to do justice to these questions add up to a big book—big enough that it won’t spoil the story if I preview its major conclusions. The Better Angels of Our Nature is a tale of six trends, five inner demons, four better angels, and five historical forces. This program aired on October 10, 2011.